1] Display of Hour, Minute [& Seconds]. 2] Digit size can be made from ^ to 16. 3] Digit type can be L.E.D. [bulb/dot] or Segment [tube/fnd] types. - 04 Information on the Screen Time, Date, Day & Temperature. 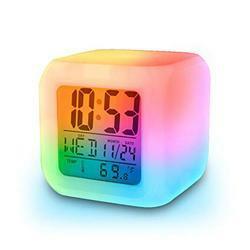 The Backlit display features time, date and temperature while the translucent case glows with 7 different colors. 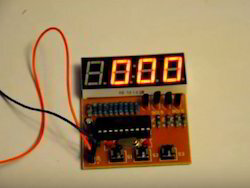 - Digital Table Clock, Time, Month, Date, Day, Temperature Display With Alarm Clock. - Alarm With Music; Snooze Function. - Birthday Reminding in Birthday Song. - Glowing LED with different color change. - Attractive High bright RED LED Characters . Indoor Use only. - Selectable 12 or 24 Hour Display Format. - Internal Battery backup maintains time during a power failure , the clock will start to display accurate time as soon as the power is restored. - Heavy duty Black powder coated Aluminum frame .